Bob | love lives on. Doug has never really shown interest in chasing squirrels. He might see them and stare but for the most part, no. Obviously last spring through fall, he was on post-surgery tie down, so much more so, nope to squirrels. This year, Doug is pretty aware of the two squirrels (they have lived just behind our fence for YEARS and I named them Breakfast and Dinner because Jake used to hunt them 24/7, even in his sleep) who use our yard as a dumping ground for acorn shells and squirrel germs. Doug doesn’t hunt them like Jake, he is much more of the: I shall chase after them but hopefully I don’t catch them because they could be violent or be concealing a weapon. He will see them from the couch, and sometimes forget he’s inside as he goes to chase after them. Almost always, they will see him (whether he is inside or outside) and do a freeze with a look that says, you are way less scary than the dog before you, and then they will take off. If Doug is outside, sometimes he thinks, I guess, that he can jump over our 7-foot fence. He however, cannot. It’s all fun. If a squirrel drops anything in its efforts to escape, Doug, true story, will go locate said item (an acorn) and bring it inside as an extra FU. I just love having acorns in my house with squirrel saliva all over them. So to recap, squirrels = friends/playful. Move over to the driveway side of the house, where Boy Bob (Bob 2) taunts Doug with his meowing. Doug is way more aware of that window now and he polices it pretty regularly. Recently I noticed that Bob’s food bowl was being taken over by ants so in true crazy person mode, I googled ant-less feeding solutions. Found a few and I’ve been outside setting up some of those fixes, along with a new condo for Boy Bob to take a break from the elements. My being out there makes Doug even more aware of the Boy Bob situation. Well this week, a crow has taken up residence in our driveway area. I have never once, in seven years here, seen a crow. So it makes sense that the first one to move in, moves into our yard. Apparently the crow thinks the condo and food bowl are his. Or hers. I don’t know crow gender. Let’s call him S/he. So this giant food thief is always lurking. This has not gone unnoticed by Doug. There is nothing, NOTHING, that Doug flips out more over than this crow. I don’t know if they know each other from the streets of South Carolina or what, but Doug sits at the window like a scarecrow and comes to life horror movie style when the crow arrives. I have yet to catch it on film because the home camera does not pick up that window and if I’m home, I’m just trying to avoid having the crow fly into our house via a suddenly broken window. To maintain my sanity on this issue, I do pretend that Doug is defending Boy Bob’s condo and food. It’s the story I plan to tell the window replacement company. It has been a little too busy over here. I am helping out with some extra projects at work so that is one part of it, our roof decided to give up 7 years into existing so when it rained ALL week last week, it did so outside AND inside. Here are some highlights as we call ‘uncle’ on May! Doug met a few ‘potentials’. It turned out they were only potentials for me. Doug hated them. Thus, we met with a new trainer, who I really like. In the past I have worked with trainers on his need to mouth feet, or my need to be able to encourage him from wild to place. This trainer is going to help us get Doug back to being more comfortable with play dates and hopefully then, a housemate. I will do a separate post on this. I don’t think Bob #1 is with us anymore. She could have relocated, we had a surge of feral cats this spring so maybe she found a new gang to run with. I have not seen her in several months. She is chipped to me and I have not gotten any phone calls so, who knows. We wish that vixen all the best. Bob #2 is a regular. Last night I pulled into the driveway and he was in our bushes. I stood in the garage to see if he would come up to his bowl and he did. Every time a bird flew by or there was a noise, he would flinch. I guess that is the life of a feral cat. After he ate he took a little siesta on the driveway and even though I’m deathly allergic and he is just generally terrified, I think he knows I’m the provider of food. Also, I love him. This spring is so much better than last spring for Doug! Last year at this time we were a few weeks into Doug’s first surgery. This year, Doug owns his yard like a boss. He chases the squirrels out of it, he digs for moles (I could live without this), he makes sure his jolly balls get the attention they deserve and then he lays down on every soft surface, except the dog chaise I bought for him. To add to the awesomeness of Doug’s life, he has graduated from being in the mudroom when I am gone to having access to the main floor of the house. I slowly gave him more freedom and he has done really great with it all. 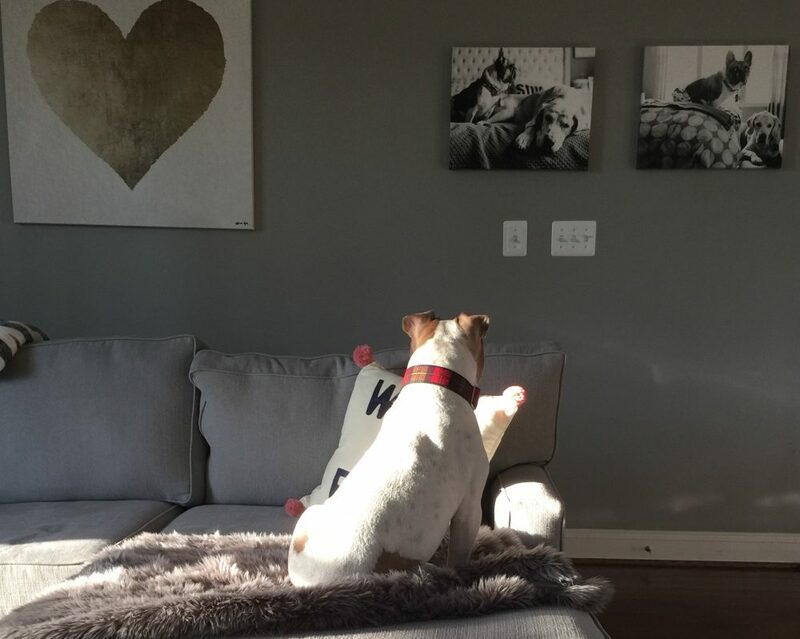 The first few days he sat and stared at the door like a statue, but somewhere around day 5 he realized he could do what all other dogs do when their humans are way – lick his parts and nap. Melvin and Jake continue to send me songs and beautiful sunsets. And Doug and I continue to help dogs in need so that their #loveliveson . Who runs the world? Moms. Happy Mother’s Day to all the moms! To the hockey moms, the dog moms, the new moms, the grand-moms. To the male moms, the single moms, the families with more than one mom moms. To the cheer moms, the carpool moms, the dance moms. To the moms that gave birth and to the moms who open their doors to children in need. To the working moms, the stay-at-home moms and the do-whatever-is-necessary moms. To the worry-they-have-no-idea-what-they-are-doing moms. To the moms of one and the moms of many. To the moms setting a better example for their kids, than what was set for them. To the moms preparing to become moms. To the moms who have lost a child. I won’t pretend to have the words. To those who have lost their moms. I wish you strength as memories sneak or flood in. Moms rule this universe. A mom created your beating heart and then (hopefully) filled it with love and confidence and joy and understanding. To my mom, you taught me the meaning of true, unconditional love. It’s the foundation of my beautiful life. To Max, Melvin, Jake, Bob(s) and Doug, being your mom, is my everything. You are my joy.